There were tears, soldiers praying, priests singing. 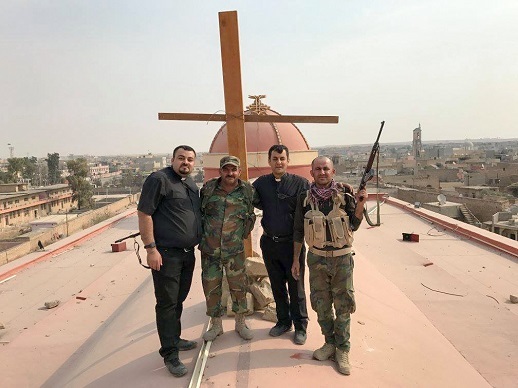 This was the moment thousands of Iraqi Christians had been waiting for: the Cross, symbol of Christ’s victory over evil, deemed illegal by IS, had returned to the Christian villages in Iraq’s Nineveh Plain. This came as news continues to emerge of more villages reclaimed from the Islamic State (IS), and more signs of destruction become apparent. As soon as it was remotely safe, the priests got into a car and were escorted back to their villages. In Christian villages like Karamles and Qaraqosh – half an hour’s drive east of Mosul – they were among the first non-combatants to return now the villages have been liberated from IS occupation. This is the Body of Christ; this is Christian land! “My dream is to bring all the Christians back to this village. Then we will worship outside on Barbara Hill; we will have the Eucharist in the open air. Everybody will see that this is the Church; this is the Body of Christ; this is Christian land. That is my dream – to give a testimony to the world,” he said. When he arrived in Karamles, Fr. Thabet found his church had been heavily damaged by IS but was still standing. The Cross has been taken off and thrown to the ground. The inside of the church was a mess, but it’s not beyond repair. Fears that the Christian village would be completely uninhabitable have proven to be unfounded. The same goes for the village of Qaraqosh, visited by Father Ammar. He reinstated the Cross on his church, helped by Christian soldiers guarding the village after it had been liberated. Fr. Thabet erects a Cross made of flowers on a hill opposite Karamles (screen grab). “I praise God for this wonderful day,” he said. “Yes, they destroyed and burned some houses and churches, but we can rebuild them. What counts is that we have prayed here and have put up the Cross. While in Qaraqosh, Father Ammar was able to locate 40 ancient documents from his church’s history, untouched by IS. “I brought those back to our people in Erbil. For us those documents are our link with our history and are therefore very important,” he said. IS conquered the Nineveh Plain – including Iraq’s second city of Mosul and many Christian villages surrounding it – in 2014. Tens of thousands of Christian families had to run for their lives. The battle for Mosul is still being fought, but large Christian settlements surrounding Mosul, like Karamles and Qaraqosh, are already liberated. At night, however, IS fighters are still attempting to reclaim territories. One Christian photographer who just returned from Qaraqosh estimated that 30 per cent of the houses have been severely damaged or destroyed. The rest need a “thorough cleaning”, he said. It is expected it will take some time before families can start returning to their villages close to Mosul. Most of them will wait for Mosul itself to be liberated and for IS to be driven out completely before they start planning their return.